MassDOT is holding a public meeting on August 8, 2012, 7pm in Legends at TD Garden regarding the planned redesign of Causeway Street, from the Keany Square at the intersection of N. Washington Street to Merrimac Street including Lomasney Way. The complete meeting notice and comment form is available here (pdf) with sections pasted below. As stated in the Crossroads Initiative plan, a key goal of the Causeway Street Reconstruction Project is to transform Causeway Street into a “great pedestrian-oriented boulevard,” make it the “anchor” for the Bulfinch Triangle/North Station business and entertainment district, reconnect the West End and North End neighborhoods, and transform the Bulfinch Triangle/North Station area into a more vibrant, pedestrian-friendly place. A Design Public Hearing will be held by MassDOT to discuss the proposed Reconstruction of Causeway Street in the City of Boston, MA. PURPOSE: The purpose of this hearing is to provide the public with the opportunity to become fully acquainted with the proposed transportation improvements for Causeway Street in Boston, MA. All views and comments made at the hearing will be reviewed and considered to the maximum extent possible. PROPOSAL: The proposed Causeway Street Reconstruction Project will improve safety for pedestrians and bicyclists. Partial full depth reconstruction and mill and overlay are proposed to resurface the existing roadway. Traffic signals upgrades will be made along the corridor in conjunction with modified lane usage to improve traffic flow and reduce congestion on Causeway Street. The project shall also address street lighting, landscaping, and sidewalk improvements. A secure right-of-way is necessary for this project. Acquisitions in fee and permanent or temporary easements may be required. The City is responsible for acquiring all needed rights in private or public lands. MassDOT’s policy concerning land acquisitions will be discussed at this hearing. Written statements and other exhibits in place of, or in addition to, oral statements made at the Public Hearing regarding the proposed undertaking are to be submitted to Thomas F. Broderick, P.E., Chief Engineer, MassDOT, 10 Park Plaza, Boston, MA 02116, ATTN: Highway Division Project File No. 606320. Such submissions will also be accepted at the hearing. Mailed statements and exhibits intended for inclusion in the public hearing transcript must be postmarked within ten (10) business days of this Public Hearing. Project inquiries may be emailed to dot.feedback.highway@state.ma.us. This location is accessible to people with disabilities. MassDOT provides reasonable accommodations and/or language assistance free of charge upon request (including but not limited to interpreters in American Sign Language and languages other than English, open or closed captioning for videos, assistive listening devices and alternate material formats, such as audio tapes, Braille and large print), as available. For accommodation or language assistance, please contact MassDOT’s Director of Civil Rights by phone at (617) 973-7171, TTD/TTY at (617) 973-7715, fax (617) 973-7311 or by email to MASSDOT.CivilRights@dot.state.ma.us. Requests should be made as soon as possible prior to the meeting, and for more difficult to arrange services including sign-language, CART or language translation or interpretation, requests should be made at least ten (10) business days before the meeting. The Causeway Street Reconstruction Project is a vital component of the City of Boston’s Crossroads Initiative, whose overall intent is to link 12 downtown streets to the Rose Kennedy Greenway—reconnecting neighborhoods and destinations once cut off by the former elevated Central Artery (I-93). The Central Artery bisected Causeway Street in the area of Beverly Street, where on- and off-ramps to I-93 were also located. In addition, the MBTA’s elevated Green Line ran down the middle of Causeway Street from Canal Street and continued north along Lomasney Way. The Causeway Street corridor can be defined as 3 distinct segments: Lowell Square, Keany Square, and the “Core Section” with its transitions. 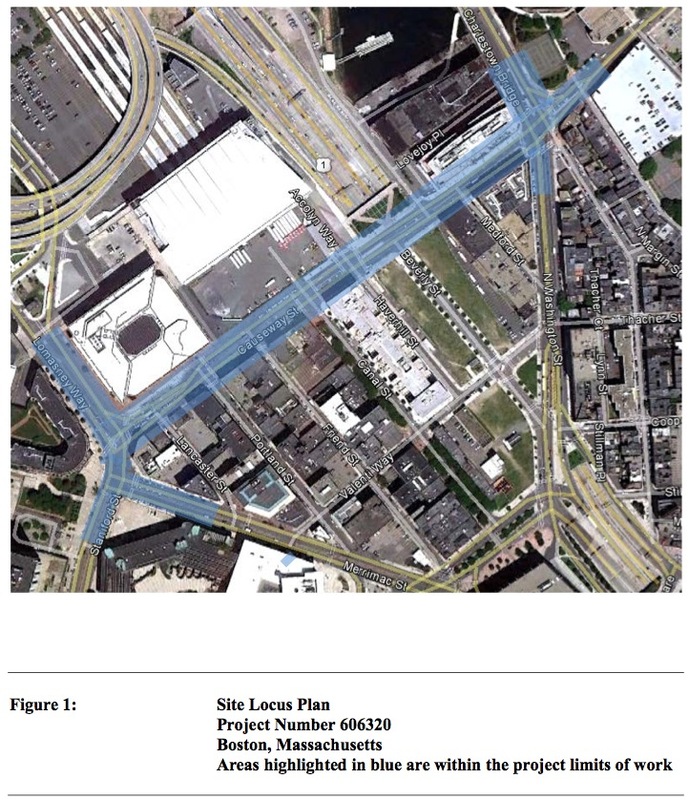 Both Lowell Square and Keany Square process significant volumes of regional vehicular traffic, while the core section—generally the area in front of TD Garden Arena and North Station between Haverhill Street and Portland Street—processes significantly more pedestrian volumes than vehicular traffic. The Causeway Street Reconstruction Project will consist of reconstructing approximately 2,000 linear feet of roadway and sidewalks from Lowell Square to Keany Square. Improvements along the corridor involve realignment and reorganization of travel lanes on Causeway Street, along with pedestrian safety enhancements and bicycle accommodation. Causeway Street improvements include associated streetscape, landscape, and street lighting improvements. The primary users of the core section are pedestrians—more specifically, pedestrians crossing Causeway Street. With this in mind, pedestrian improvements include widening sidewalks and providing bump-outs at crosswalks to reduce crossing distances and for better driver visibility of pedestrians. Narrowing the overall roadway width will not only shorten the crossing lengths, but also help reduce the speeds along the corridor. Median refuges will also be provided to eliminate the need for major traffic control and require pedestrians to only look for traffic in 1 direction at a time. These enhancements will create more distinct pedestrian crossings minimizing the desire for jaywalking. Raised intersections are also proposed as a traffic calming measure at Causeway Street/Friend Street and Causeway Street/Canal Street. Raised intersections are typically used to slow vehicular speeds and improve the visibility of pedestrians. • New street trees and sidewalks throughout the limits of work. The design of the Causeway Street Reconstruction Project is currently being funded through the Boston Public Works Department and managed by the Boston Redevelopment Authority. While all Causeway Street Reconstruction Project roadways are under City of Boston jurisdiction, Causeway Street, North Washington Street, Lomasney Way, and Staniford Street are all Federal- Aid Eligible. With this in mind, the City intends to seek funding through various Federal-Aid sources. All federal transportation funding in the Commonwealth of Massachusetts flows through the state’s transportation agency, MassDOT. As such, both the City of Boston and MassDOT are proponents of this project and partners in its design and construction. The Causeway Street Reconstruction project is expected to reach the 100% design level by the winter of 2012. Construction will potentially take place during the 2015 and 2016 construction seasons, depending upon T.I.P. priorities and funding allocation. Reader Poll: Do You Favor the Mayor’s Plan for a Dedicated Bus / Bike Lane on N. Washington Street?